Are You a Dope Head? 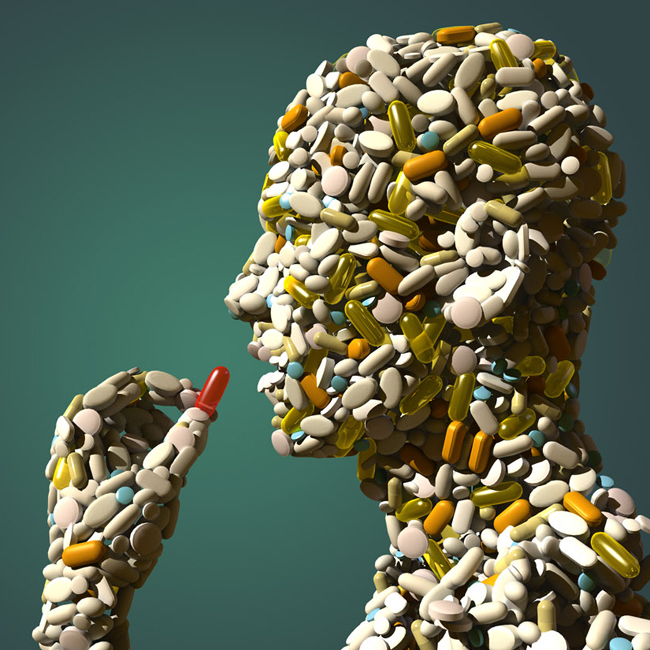 One body, multiple drugs: It can be a recipe for disaster. In a recent study conducted by Medco Health Solutions, one of the nation’s largest consumer prescription management companies, more than half of all insured Americans is dependent on one or more prescription drugs to treat chronic health problems. Medco’s report indicates that the most widely prescribed drugs are those that treat chronic health issues such as hypertension and to manage cholesterol. In 2007, over 50 percent of all Americans (both adults and children) were taking one or more prescription drugs to treat a chronic illness. The term drug overdose (or simply overdose or OD) describes the ingestion or application of a drug or other substance in quantities that are excessive. An overdose is widely considered harmful and dangerous as it can result in death. The word “overdose” implies that there is a common safe dosage and usage for the drug; therefore, the term is commonly only applied to drugs, not poison, though even certain poisons are harmless at a low enough dosage. Drug overdoses are sometimes caused intentionally to commit suicide or as self-harm, but many drug overdoses are accidental and are usually the result of either irresponsible behavior or the misreading of product labels. Drug overdose often happens as a result of the use of multiple drugs with counter indications simultaneously (for instance, heroin/certain prescription pain medications and cocaine/amphetamines/alcohol.) Usage of illicit drugs that are of unexpected purity, in large quantities, or after a period of abstinence can also induce overdose. Cocaine users that inject intravenously can overdose accidentally as the margin between an optimal flash and an overdose is small. Accidental overdoses can eventuate out of a number of different causes including overprescription, failing to recognise a drug’s active ingredient, or unwitting ingestion by children A common unintentional overdose in young children involves multi-vitamins containing iron. Iron is a component of the hemoglobin molecule in blood, used to transport oxygen to living cells. When taken in small amounts, iron allows the body to replenish hemoglobin, but in large amounts it causes severe pH imbalances in the body. If this overdose is not treated with chelation therapy, it can lead to death or permanent coma.